I have different closets for different accounts, but when I want to look up items I own, it gives me items from all accounts. I separated the items by accounts already, into different lists. Is it possible to only see items from one account when I'm trying to dress a pet from that account? That would be cool for inspiration if you wanted a new pet and weren't sure how to customize. Hmm. It seems reasonable to be able to sort both by name and by date. The biggest challenge would probably be working it into the existing UI in a consistent way without further cluttering the search navigation controls. Low priority, but I’ll keep it in mind :) Thanks! Can you create a remove all button? And multiple pages? I see that a similar suggestion was made over a year and half ago, but it's still under review. I bring up the suggestion once more, since I know a lot of people would rather just redo their list from the very beginning than go through hundreds (or thousands in my case) and delete them one by one. Unfortunately for me, since my list is so large, the page itself won't even load for me to try and delete them one by one. A remove all button would be a great feature to have. And as I've mentioned the lack of page load because I have so many items, I think a couple hundred items per page would do the trick in solving this problem. Even 500 items per page would help immensely. Yes, indeed. Pagination and bulk management are high on the todo list—but it’s a big task on a long list, and my time is way more limited than I’d like :/ Sorry for the ridiculously long wait, and I’ll keep you posted. Allow us to reverse lookup the default Customisations that appear when you start a pet from scratch? When you choose to "Start from scratch" when Customising on DTI, sometimes when you're selecting a pet to start with it displays an image of an already Customised pet. 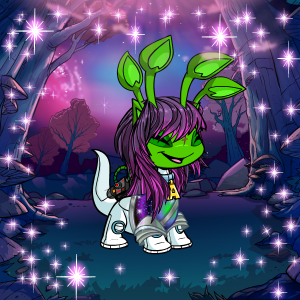 For instance, if I was to select "Alien Aisha" it wouldn't display a blank, unCustomised Alien Aisha, but this here. I'd really like to know the wearables that go into these Customisations because they're really cool. DTI is able to reverse lookup a pet's Customisation if you type that pet's name in, but these are static images. So is it still possible to know? Where are these coming from? I would love to be able to organize my outfits that I create. I make a lot of customization plans and need to be able to organize them without pouring through a bunch of outfits to find the right ones. Can this become a possibility please?